I’ve been watching Caillou for about 10 years. It all started with my son. What a cute show. I love watching Caillou’s adventures. My son loved watching him too. It was one of those cartoons that was safe for all ages. It was perfect for us, until Hunter just outgrew him. Now that Savannah’s here, we get to watch it again! Savannah loves watching just as much as her big brother did years ago! I received Caillou’s Holiday Favoritres. It’s a 3 DVD collection. Each DVD is about 78-90 minutes long, including several episodes each. 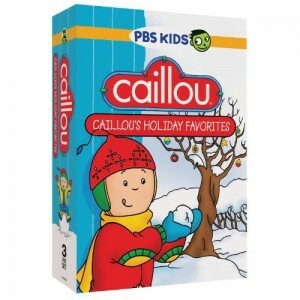 DVD one is Caillou’s Winter Wonders, including Caillou the Snowman, It’s Cold Outside and Winter. DVD two is Caillou’s Holidays, including Halloween, Thanksgiving and Christmas. DVD three Caillou’s World of Wonder, including episodes of Caillou exploring everyday life. We immediately put in Caillou’s Winter Wonders to watch. How fun it was to watch Caillou enjoy his winter, building a snowman, sleighing and his Christmas. I love the episode where he can’t find his toboggan and his teacher helps him make one from a box. His toboggan was the best in the class! We live in the south and don’t see much snow, so it was nice to see Caillou playing in it! In Caillou’s Holidays, our favorite is when Caillou celebrates Chinese new year with his friend, Sara. He tries new foods and learns about the big dragon in the parade. there are so many different holidays shared, I love that Savannah gets to learn these as well. I’ll have to take this one into her school to share. In Caillou’s World of Wonder, there are so many favorites!! I love when Caillou can’t decide which toy to take to show and tell. He has so many wonderful toys, then he thinks real hard and with the help from his daddy, he takes his little sister, Rosie to school to “surprise” his friends! Then there’s the episode where he convinces Clementine’s older brother, Billy, to let them play on his drums. He dresses up like a grown up and Billy finally lets them play. All the episodes are classic Caillou and sure to please everyone in the family! Purchase at Amazon. I received the above DVD collection in order to facilitate this review. Opinions are my own. My kids love watching Calliou! My daughter used to watch Caillou all of the time. Never heard of this, it will be fun when my kids start having kids to give them fun DVD’s for there kids. That toboggan story sounds super cute! My kids love calliou. This looks like a good one!